We booked another Co-Wheels car today. I think I’ve got the system all figured out and have tried a few different cars now including electric, petrol, and hybrid. Most of the problems I had in the beginning were down to user error, I’m embarrassed to say. 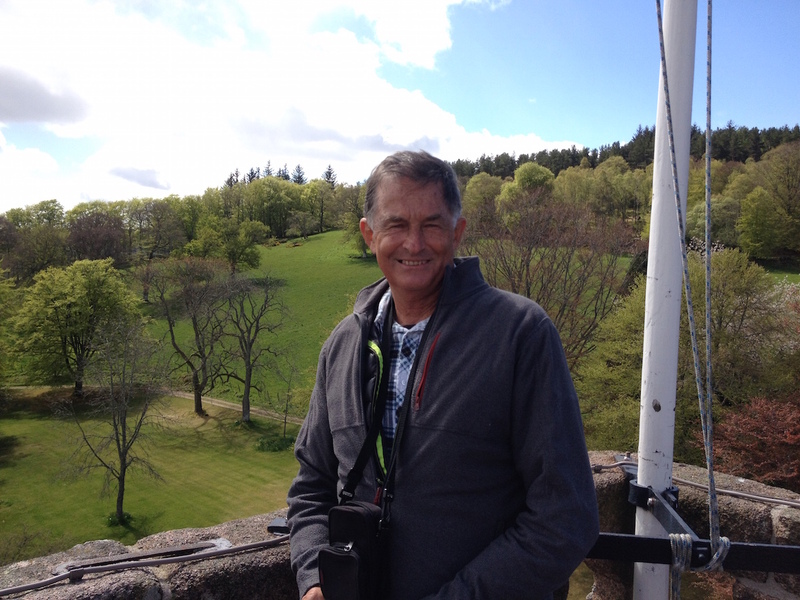 We drove out to Craigievar Castle, about 30 miles west of Aberdeen. The drive was just lovely. We drove to Banchory first and followed the same route we took before Christmas when we went to Ballater but how different it was this time! The countryside is in full bloom now and all the trees covered in leaves so it looked very lush and leafy. It was lovely in winter too but I have to say it was quite spectacular today. We stopped at Morrisons supermarket in Banchory where I made a fool of myself not once but twice. I bought some small punnets of vegetables to plant in my garden and clumsily knocked one over on the conveyor belt at the checkout and sent dirt flying everywhere. Then when we went to leave, I pushed open an emergency door, not realising it was an emergency exit, and set the alarms off. 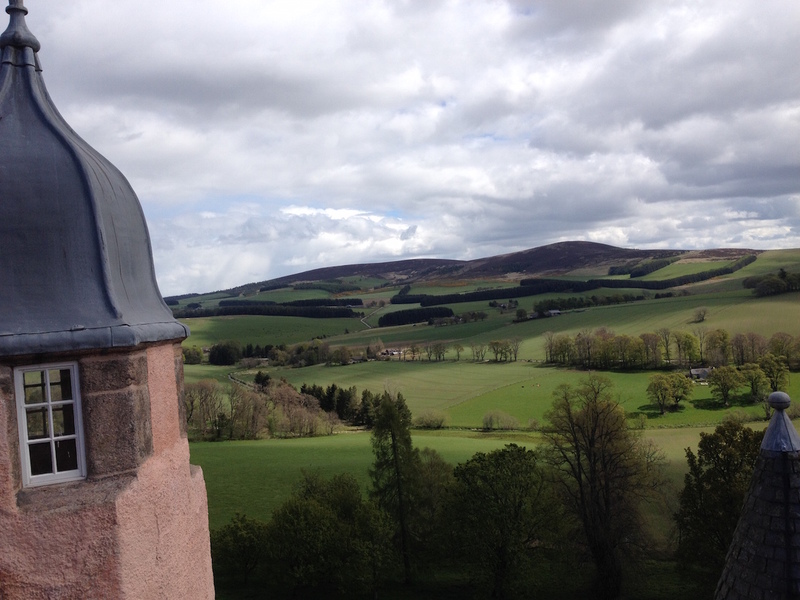 So we high-tailed it out of there for Craigievar Castle. I half expected to see Rapunzel lowering her long hair down from one of the upper windows. We went on a guided tour which is the only way to see the inside and I can understand why. All the original furniture and art is still in place, as it has been for hundreds of years. The castle was built in the 1600s by William Forbes. I wasn’t allowed to take photos of the inside unfortunately so I don’t have any to share but it was marvellous. The ceilings were plastered by an Italian artist when the castle was first built and they are impressive. The spiral staircase is a masterpiece, and the rooms were more cozy and inviting than I had imagined castle rooms to be. We went all the way up to the roof where we got to enjoy the splendid views. The castle motto is Doe not vaken sleiping dogs which means do not awaken sleeping dogs. 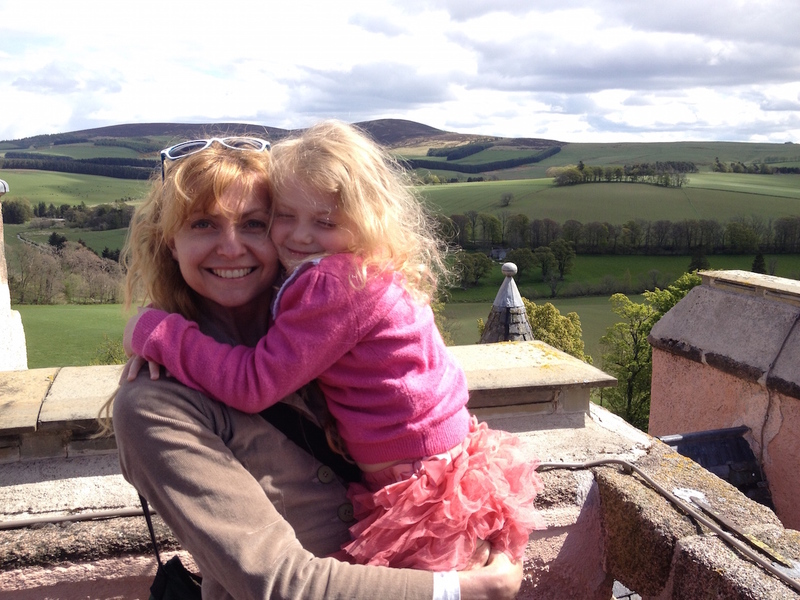 This part of Scotland has so many castles that I think it will be some time before we’ve visited all of them. 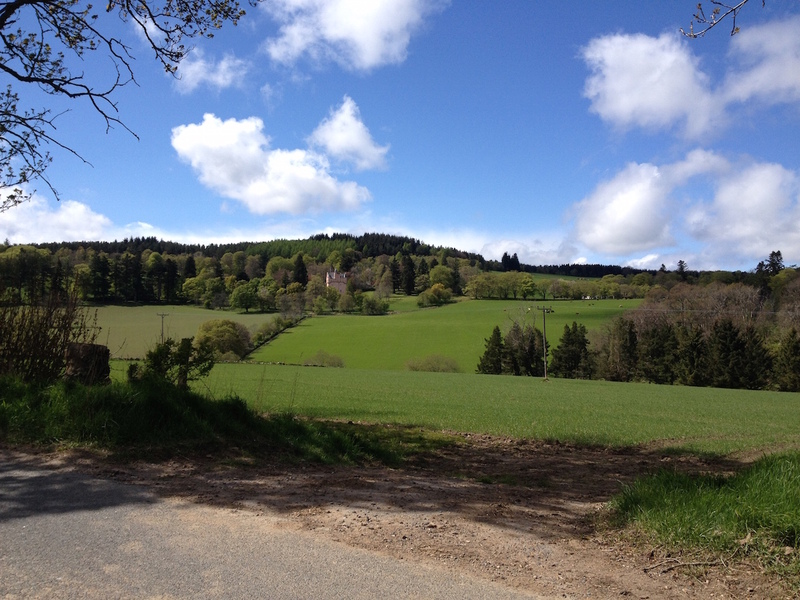 It’s a lovely place to live, not just because of the interesting history, but also because it’s less populous than other parts of the UK, and there’s some lovely scenery with rolling hills, forests, rivers, and beaches. 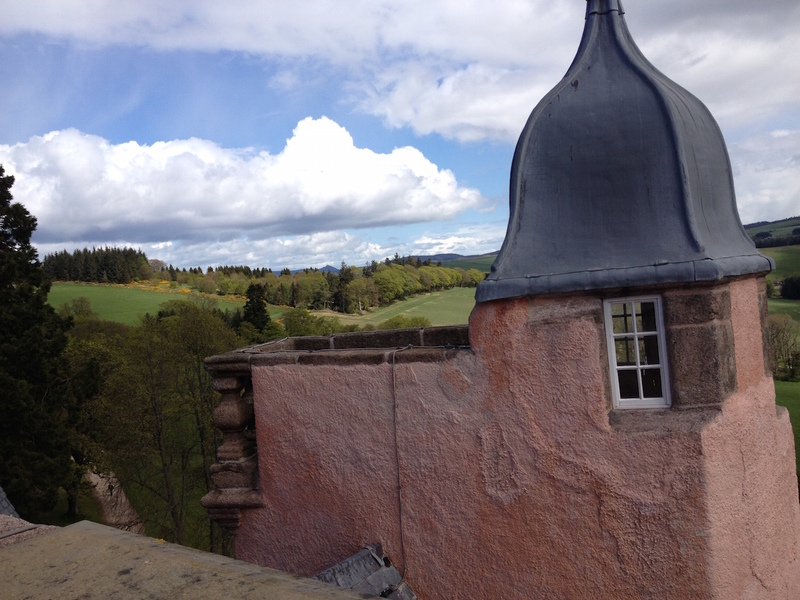 Posted in Journal and tagged Aberdeenshire, Cairngorms, castle, Craigievar Castle, photos, Scotland, travel. Bookmark the permalink. Those are some amazing views, it does indeed look like something out of a fairy tale. I can’t wait to someday come visit that area and explore some of castles in person. 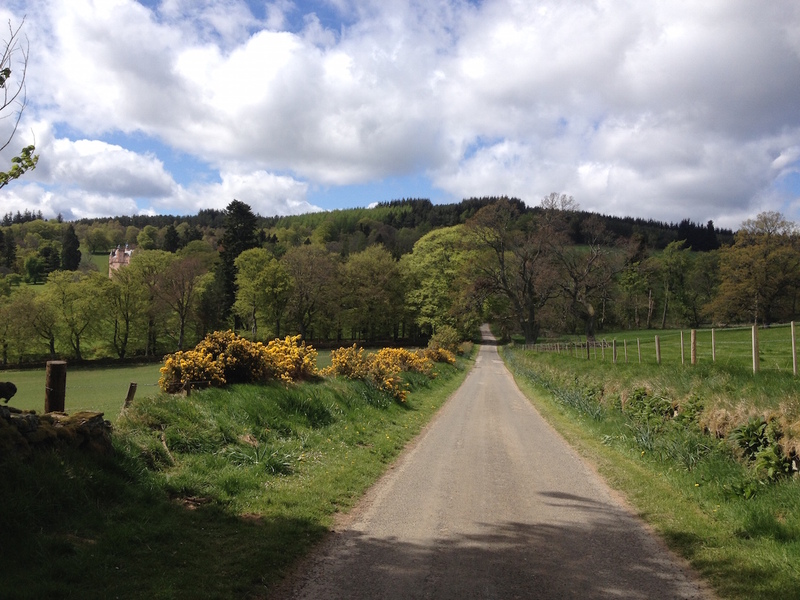 I’ve just discovered that Aberdeenshire has more castles per acre than anywhere else in the UK. It did feel like there were an awful lot of castles in the area and there really are. 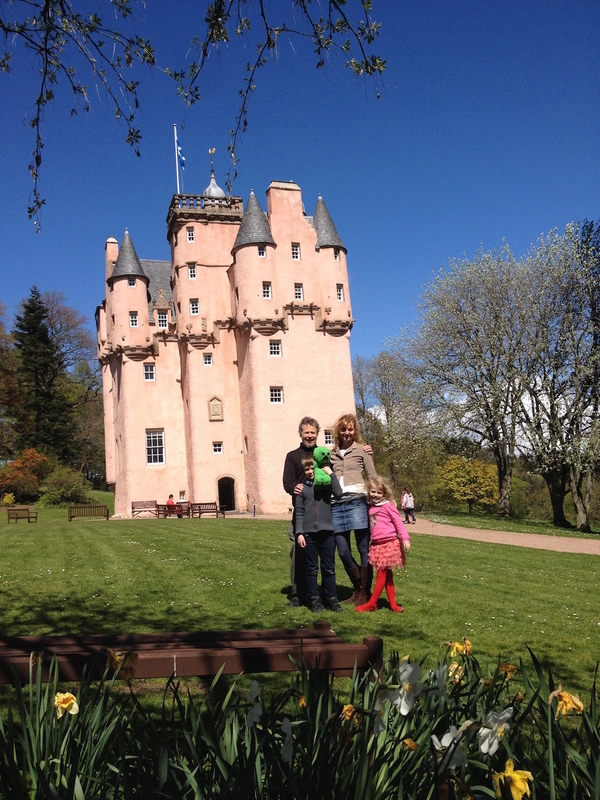 You and the family are welcome to stay with us if you make it to Scotland one day. Yep, agreed, you’re in amongst some real beauty and also wilderness. Thank goodness the Scots kept out Mr Trump! Well, he managed to build a golf course here so I don’t think they completely succeeded but they did a damn good job of standing up to him. I was very proud of their campaign in the face of so much money. Wow. It’s like a fairy tale indeed. Thanks for showing it to us. And what a funny start of your day! Amazing 🙂 Your travel adventures have made me want to visit Scotland more than ever. Nicely done. Good! It’s definitely a place worth visiting and this part of Scotland is often ignored by tourists yet there’s so much to see here. I am so enjoying your adventures. It makes me yearn for castle tours myself. 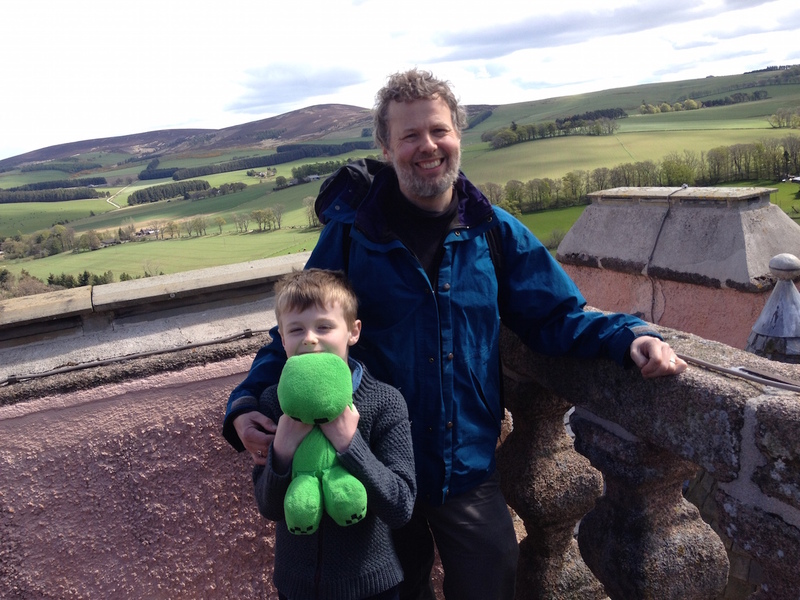 There’s a castle trail you can do in Aberdeenshire. I’m not sure whether it includes absolutely every castle but there are signs for it on the road. There are a few castles with that pink colour. I meant to ask whether there was a reason for this or if they just liked the colour. I think it really suits the castle. I’m really lucky to live so close to such lovely countryside. We can drive for 10 minutes from our house and we’re out in the country and I love that. It makes a change from the hour or so of battling through Auckland traffic before you can even leave the city. There’s a very nice virtual tour of the interior here. All of the rot seems to have been cleverly concealed. Cunning, these Scots. I didn’t notice at first, but the tour controls allow for a tilt up to get a good view of the ceiling plaster. Impressive work! Ah, yes. That virtual tour is great. Thanks for that! The ceiling is really wonderful and all still original bar the top two floors. At one point in the castle’s history there was a leak in the roof and so they had to replace some of the ceilings. The very top floor just has a plain one and the ceiling in the children’s nursery was redone but it’s not nearly as detailed as the other ones. I didn’t notice any rot when we were there and the castle didn’t seem damp at all and I have a good nose for finding damp. About 30-40 years ago they had the exterior re-plastered and the experts used a double layer of cement. This turned out to be a huge mistake as cement doesn’t breathe and the castle started to suffer from damp. They spent the next 30 years saving up to have it removed and redone properly with lime and this happened in 2010. Apparently the scaffolding alone – which they needed for 18 months – cost £150,000. If you’re going to visit castles, you need some way of knowing what is available to see, or what is that odd ruin you can see from the road and why don’t we just jump this fence to have a close look. GEnerally you want either Martin Coventry’s “The Castles of Scotland”, which covers all of scotland and all the sites he could possibly identify. It has some errors in it, but as an all round gazetteer of the country cannot be beaten, unless you have a good 3G signal and the Canmore database bookmarked. With a better reputation for accuracy, and I believe he’s visited all the sites he mentions, unlike Coventry who did mostly book research, is Mike Salter. 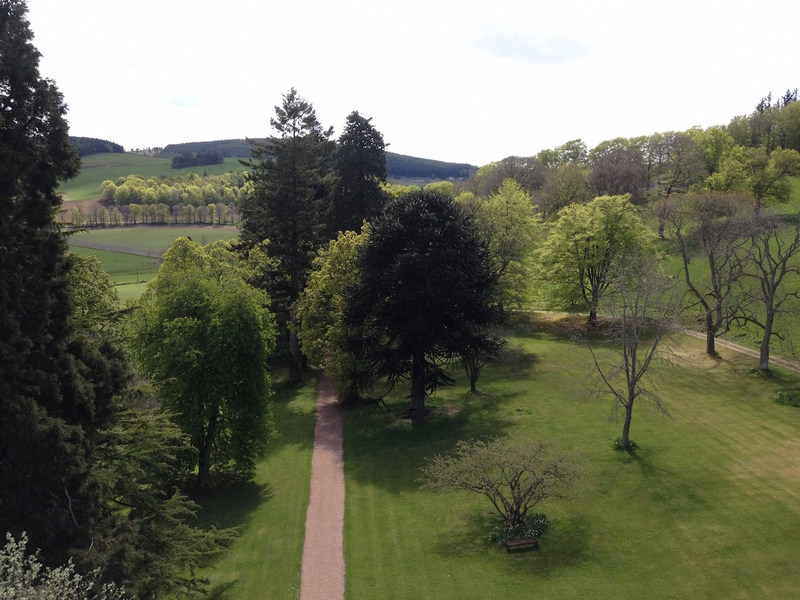 We’ve joined up with Historic Scotland and the National Trust for Scotland (why are there two!!!!) and they’ve provided some books listing all the sites. We’ll probably make our way through these first. Although the Coventry book looks like a nice book just to have around the house. 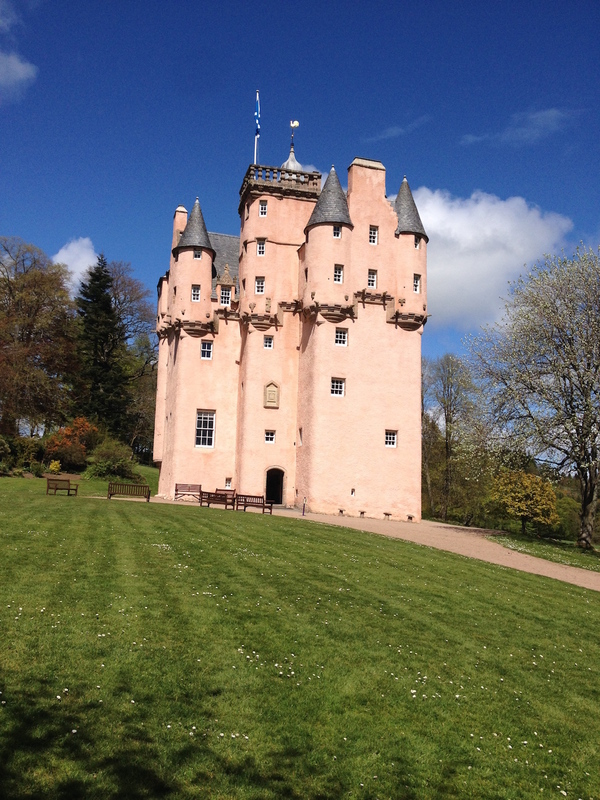 How funny, a real pink castle!